Easter week is undoubtedly one of the best events in Malaga. Experiencing the processions and atmosphere throughout Holy Week counts as one of the top things to do in Malaga. But if you aren’t local or don’t have much of an understanding of Andalucian culture, Easter in Malaga can be a bit of a puzzle. To help you make sense and get the most out of this unique occasion, we’ve put together a guide to who’s who and what’s what during Holy Week in Malaga. Easter in Malaga wouldn’t exist without the brotherhoods, known as hermandades or cofradías. The city has over 40 of them and the oldest dates back to 1505. These religious associations carry out charitable acts all year round but they come into their during Holy Week when their processions take centre stage in the city. Did you know? The brotherhoods in Malaga all belong to an umbrella association that is responsible for organising the itineraries for the processions. Between Palm Sunday and Easter Sunday, dozens of processions take place in Malaga. All different but with similar components. The giant thrones that form the centre pieces for all processions in Malaga are known as tronos. They’re giant platforms supported by up to 8 metal beams carrying the figures and decoration. Some figures date back centuries and one of the oldest is the Cristo de Mena, carried by the Legionnaires on Maundy Thursday. Processions generally have 2 thrones: 1 Christ figure and 1 Virgin. The throne carrying Christ is usually less elaborate and without a canopy. The Virgin, on the other hand, tends to be bigger and brighter and have a large ornate canopy over the figure. The Christ throne leads the Virgin. Did you know? The largest throne in Malaga is the Last Supper (above). You can see it at any time of the year in the Mártires Church on Plaza de los Mártires just behind the Thyssen Museum. Unlike those in the rest of Andalucia, the thrones in Malaga are huge and extremely heavy; the largest need 250 people (usually men) to carry them around. Each throne bearer takes a position with their shoulder under the beam and bearing the weight. They’re usually dressed in suits or the colours of their brotherhood. Some are blindfold and you’ll often see some walking barefoot. Did you know? Throne bearers need endurance as well as strength. The longest procession during Holy Week in Malaga lasts for 13 hours. Getting these giant cargos around the narrow streets in Malaga takes some doing so each throne has a mayordomo. His job is to guide the throne to make sure it fits round every corner. He’s also in charge of how long the throne bearers get to rest. To let them know when they can stop and have to start again, he taps the bell at the front of the throne. Did you know? The bearers of the two thrones from the Hermandad de la Salud on Palm Sunday have to carry the thrones out of the church on their knees. Known as nazarenos, the penitents form the main body of all processions in Malaga. They wear tall black conical hats (capirotes) that cover their faces so you only see their eyes. This tradition also dates back centuries and was introduced to allow sinners to be anonymous. They also wear long robes in the colour of their brotherhood. They carry crosses, candles or staffs depending on their rank and some walk barefoot for extra penitence. Men, women and children may be nazarenos. Did you know? Up to 1,000 nazarenos accompany each procession. You’ll also see women dressed in black walking in the procession, usually behind the Virgin. All wear a black mantilla, usually elaborate and often a family heirloom, held in place by a tortoiseshell fan in their hair. Did you know? The nazarenos on the Palm Sunday processions are mostly children who carry palm leaves instead of candles. 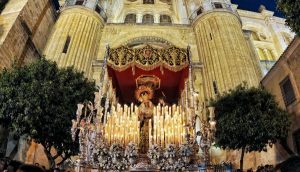 Apart from the final stages of the processions on Good Friday that take place in silence, all Easter processions in Malaga include a lot of loud music. The Christ figure is accompanied by a band made up of trumpets and drums while the Virgin gets a full band. During the most solemn moments you’ll just hear the sound of drums. You can get a good idea of what you’ll hear during Holy Week in Malaga here (scroll down to Marchas de Semana Santa). Did you know? Processions often include a saeta (a flamenco lament) sung spontaneously by a spectator, often in a balcony. The song is usually dedicated to the Virgin and the sound is one of the most spine-tingling you’ll hear Easter in Malaga. All thrones are covered in flowers and you’ll see literally thousands of roses, carnations and lilies during the Holy Week processions in Malaga. 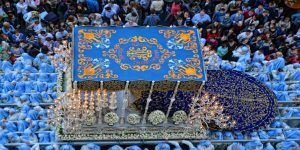 The Virgen de las Penas (procession on the Tuesday during Easter week) boasts a cape of flowers that stretches for several metres along her throne. Did you know? People watching from their balconies often throw rose petals down on the throne as they parade below. Some penitents carry incense burners that they sway to and fro during the procession. This intense smell lingers in the city streets long after the procession has passed. Rivalling it is the scent of orange blossom from the trees in full bloom in the city centre. Did you know? Malaga has an entire museum dedicated to Holy Week. Visit it in Calle Muro de San Julián, a block south of Calle Carretería, off Calle Nosquera. Malaga loves Easter and the locals turn out in their thousands to watch the processions. Unlike some parts of Andalucia, Holy Week in Malaga isn’t a time for quiet religious reflection. Instead you’ll find that spectators clap when the thrones pass by and devotees of the different virgins often shout ‘¡Viva!’ when she passes. Did you know? Bar Merchanas in Calle Andrés Pérez has an Easter theme with memorabilia on the walls and Holy Week music giving you the chance to get a taste of Easter in Malaga at any time of the year. Some thrones aren’t stored in churches or chapels on their procession route and so they have to be moved in time for Holy Week. 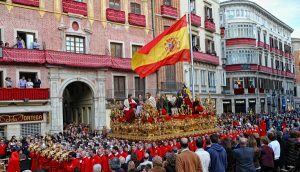 In the week before Easter, several mini-processions/transfers (known as traslados) take place in Malaga as members of the brotherhoods transfer the thrones to the starting point. Did you know? All processions have different routes, but they all go along the Alameda Principal and Calle Larios and visit the Cathedral.